Europa Grain Free Wet is a specially formulated diet for adult dogs aged from 1 year onwards, Europa Grain Free Wet Food is made by using only the finest ingredents while avoiding ingredients known to cause allergies in dogs. A combination on of 66% Fish & 34% Fresh Fruit, vegetables and botanicals makes this an excellent all round diet for your dog. 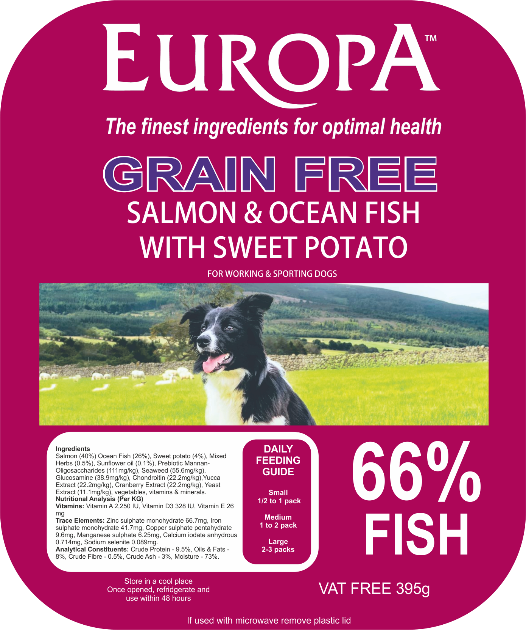 Europa Grain Free Wet Food can be fed alone or accompanied with biscuits, this grain free diet is suitable for all dogs including sporting & working dogs. Salmon (40%) Ocean Fish (26%), Sweet potato (4%), Mixed Herbs (0.5%), Sunflower oil (0.1%), Prebiotic Mannan-Oligosaccharides (111mg/kg), Seaweed (55.6mg/kg), Glucosamine (38.9mg/kg), Chondroitin 22.2mg/kg),Yucca Extract (22.2mg/kg), Cranberry Extract (22.2mg/kg), Yeast Extract (11.1mg/kg), vegetables, vitamins & minerals. Crude Protein - 9.5%, Oils & Fats - 8%, Crude Fibre - 0.5%, Crude Ash - 3%, Moisture - 73%.